We met Doc randomly in Sa Pa, during a short taxi ride to the train station. He made an impression on Becca and I, so we met in Nha Trang 3 weeks later, where he now lives with his wife Bao An. 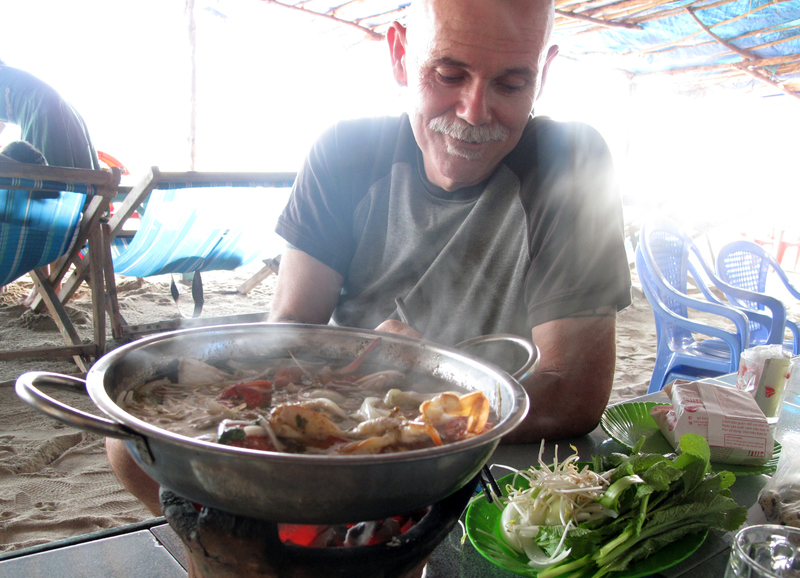 Doc, enjoying a hot pot on Bai Dai Beach. Doc Bernie Duff was a medic, stationed in Phu Tai, Vietnam in 1969 and 1970 during the Vietnam War. He, like all the other veterans, have many stories to tell during their tour in Vietnam, but what makes Doc’s story so interesting is what happened decades later. After his tour in Vietnam, Doc came back to US with much public criticism, dealing with the stresses of acclimation and depression, common to so many other vets. But Doc found a unique outlet that would change his life. Doc began to paint. As a healing and purging mechanism for himself and others affected by the tragedies of Vietnam, Doc painted vivid war scenes that captured an essence of purity and humanity, beginning to help heal and provide control for other vets. His paintings created a meaningful bridge. He was eventually commissioned to paint a scene for an organization in Vietnam, then he was asked to come present the painting. This request caught Doc off guard – did he really want to revisit the place that had caused him nightmares for so many years? He decided to do it, and the trip became a huge personal journey for him and the other veterans aslo asked to return. Two young Vietnamese-American girls also made the journey, and it was their excitement upon landing that made the men realized that this wasn’t the war-torn country they had left decades before. They were greeted with open arms by the Vietnamese people, which helped the traumas of their past begin to fade. Doc now runs Orangecarers, an organization that raises money to build houses for impoverished victims of Agent Orange, and continues to paint scenes of powerful subject matter relating to Vietnam. 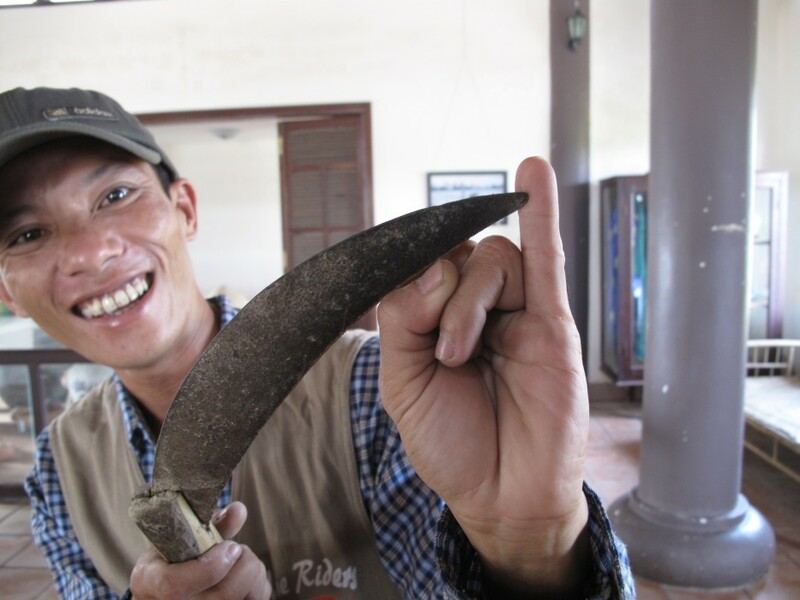 Quy, displaying his scar from harvesting rice. We met Quy (pronounced “Quee”) one night while eating dinner at a small, local place. We seated ourselves next to some barefoot drunk guys from Scotland who in the course of 30 minutes, had drunkenly fallen on Becca, kicked a cement block and were leaving trails of blood, and pissed off everyone in the establishment. They left, and became a great conversation for the surrounding tables. Quy introduced himself with an contagious smile and good english, and 3 beers, and a few shots of rice wine later, we knew his story. Quy’s family was divided during the Vietnam War days. His two uncles fought for the South, and his father fought for the North. Quy’s father survived the gruesome war, but not without being exposed to chemicals like Agent Orange. Instead of returning home, he remained up north for years, rarely speaking with his family. He finally returned to Hue to reunite with his family and heal. Quy’s grandmother wanted a grandchild, but the birth defects of Agent Orange are so aweful, that he refused for 20 worrisome years until finally marrying his neighbor. They had a boy, and named him Que, meaning “precious” because he was healthy and perfect. He eventually gained two sisters. Quy’s father died a few years ago, and he had to drop out of school to support his family and build his father’s tomb. He is now part of Hue Riders, a tour organization, which we took for a two day journey to Nha Trang. He is also married and expecting his second child in the next week. An amazing person full of optimism and spirit.